The definition of a natural swimming pool really takes into account three features. First, a natural swimming pool uses no added sanitizers to clean the water. Second, in a natural swimming pool, the water is living. In other words, it is not kept clean by making the water uninhabitable by algae and other unwanted biology. And that brings us to the third part of the definition. A natural swimming pool is cleaned by planting a very specific type of artificial wetland or water garden. The natural filter organically removes biological matter and the food that feeds it through natural processes, simply by growing and using the nutrients in the water. Clearly, the secret sauce, so to speak, of natural swimming pools is the natural filter. This filter is called a regeneration zone, because it takes in water from the swimming area and regenerates it into clear, clean water that is returned to the swimming area. Every natural swimming pool is made up of two parts, the swimming area and the regeneration zone. (Bio-pools, which are also sometimes called natural swimming pools, use a different method that does not include a regeneration zone.) 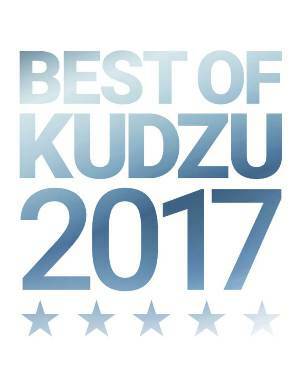 Most builders suggest a minimum area of 50 square meters for a natural swimming pool, split equally between a regeneration zone and a swimming area. Because natural swimming pools were developed in Europe, sizes for natural swimming pools are usually given in metric units. However, a good approximation of the minimum size is about 540 square feet, evenly split. That would allow for a swimming area of at least 15’x18’. The swimming area is built with a liner, often made of rubber, to prevent leakage and keep the clean water separate from the soil around it. It is separated from the regeneration zone by a submerged wall. The wall is tall enough to keep the plants in the regeneration zone and out of the swimming area but stops about 3 or 4 inches below the surface of the water. That allows water to flow freely between the two areas. 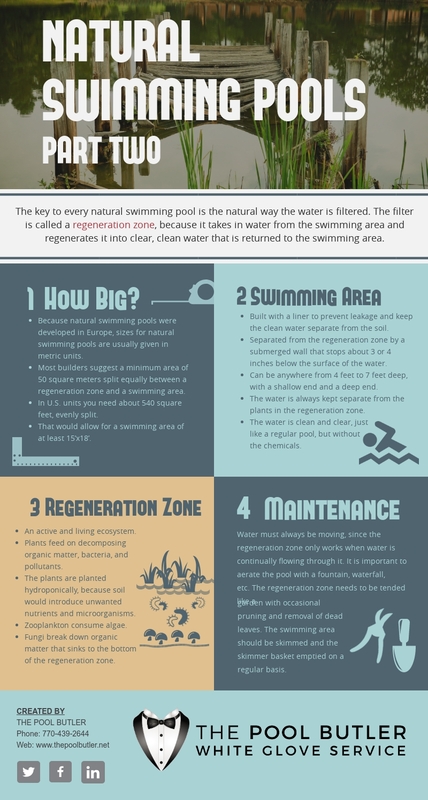 In some cases, especially with public pools, the regeneration zone may be some distance away from the swimming area, and the water is circulated using pipes and a pump. The swimming area can be anywhere from 4 feet to 7 feet deep. Like a typical pool, it can have a shallow end and a deep end. The water in the swimming zone is always kept separate from the plants in the regeneration zone. That way, the water in the swimming zone is clean and clear, just like a regular pool, but without the chemicals. The regeneration zone is an active and living ecosystem. It contains a variety of plants plus microorganisms. The plants act as a natural filter. They feed on decomposing organic matter, bacteria, and pollutants and convert them into biomass, i.e., plant tissue. As the plants grow, they filter the water they are planted in. However, this system is not identical to a natural pond or wetland. The plants are planted hydroponically, with their roots growing in water, not topsoil. Topsoil would introduce too many nutrients and microorganisms. The specific variety of plants varies by location. Just like you wouldn’t plant the same garden in every climate, different climates are more suited to different filtering plants. For this reason, every natural swimming pool is unique. To build an effective plant filter, you will need to consult an experienced builder who can select the right plant varieties for the job. However, with the proper design, natural swimming pools can be installed in most climates. In Europe, where natural swimming pools are more common, they have been built in every climate from the Alps to Mediterranean resorts. In addition to plants, the regeneration zone is home to a variety of microorganisms. Zooplankton, tiny animals, play an important role by consuming algae. For example, a species of zooplankton called daphnia feed almost exclusively on algae, which does wonders for purifying your pool water. Fungi also play an important role in breaking down organic matter and debris that sinks to the bottom of the regeneration zone. In addition to the filtering power of the plants and animals in the regeneration zone, many natural swimming pools include some type of biofilter. In a biofilter, water flows downward through a porous organic material, such as gravel or peat. The organic material is covered in a biofilm, a thin layer of interconnected microorganisms that consume the pollutants. Once the water passes through the biofilter, it is almost completely clean. Bio-Pools are sometimes called natural pools, but they are very different from the traditional definition of a natural swimming pool. That’s because bio-pools don’t have a regeneration area. Instead, the biofilter does all of the work. Natural swimming pools don’t require the addition of any sterilizers, but there is still some maintenance. First, it is essential to keep the water moving. The regeneration zone only works when water is continually flowing through it. Also, some bugs such as mosquitoes will lay eggs in stagnant water, so keeping water moving prevents infestation. It is also important to aerate the pool water so that the plants receive the oxygen they need to grow. Adding a waterfall is a great way to aerate the water and add a natural touch to your pool. However, any fountain will work to aerate the water. The regeneration zone also has to be tended, similar to tending a garden. Some pruning and removal of dead leaves are necessary from time to time. 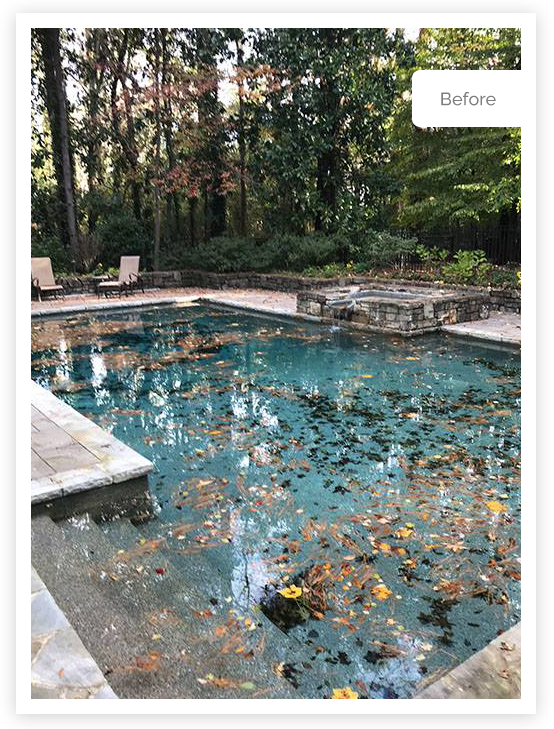 The pool also needs to be skimmed and vacuumed regularly to remove large and small debris, just like a traditional pool. The regeneration zone will filter the water, but it can’t remove large debris. Most natural swimming pools are also built with a skimmer that collects floating debris. Just like in a traditional pool, the skimmer basket needs to be emptied on a regular basis to prevent clogs. The cost of a natural swimming pool, just like any swimming pool, depends on many factors. The size of the pool, the materials, and the landscaping around it all play into the total cost. A standard family-sized pool can cost $60-$70k. That cost includes a wooden jumping pier, a quality wooden underwater wall, all of your starter plants, and the built-in biological filter. It also includes labor and equipment rental. If you want to add hardscaping, such as a waterfall and other natural-looking features, you can expect to add another $10-$15k for a single 20-ton load of large rocks. However, once the pool is constructed, maintenance costs are typically lower than a traditional pool. The pump is usually small and energy-efficient, and there is no cost for added chemicals. 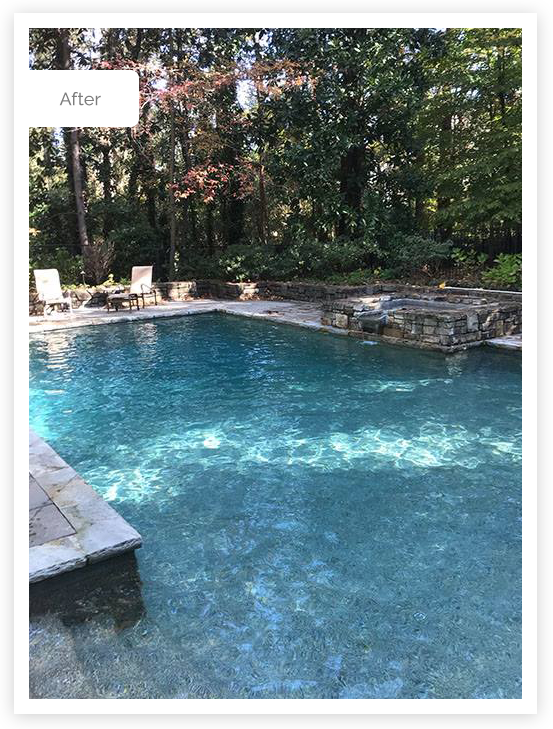 If you want to learn more about natural pools, contact The Pool Butler , and we’ll put you in touch with a builder in your area.